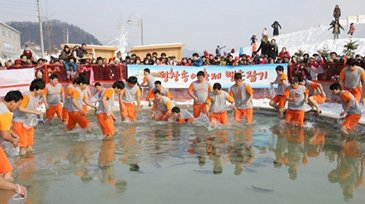 The 8th Pyeongchang Trout Festival is currently being held in the scenic provincial city of Pyeongchang, the host city of the 2018 Winter Olympics. 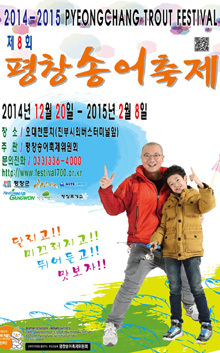 The winter festival will run for 51 days from Dec. 20, 2014 to Feb. 8, 2015. The event was organized by Chairperson Choi Gyo-Sun of the Pyeongchang Trout Festival Committee (www. festival700.or.kr). Chairperson Choi said both local and foreign people can enjoy a variety of different programs and leisure sports including trout catching by bare hands. “This winter festival can be a great family tour occasion,” the chairperson said. “Pyeongchang Trout Festival” is one of the top three winter festivals held in the nation along with Inje Ice fish Festival and Hwacheon Mountain Trout Festival. The festival was selected as one of the major 20 most enjoyable winter festivals in the nation by Korea Tourism Organization (KTO) in 2013. Pyeongchang in Gangwondo (Province), the town of snow in the nation was chosen as the venue of the 2018 Winter Olympics. A number of local and international tourists visit the venue every year for seeking various tour programs. For its geographic location they can gain an easy access to the nearby ski resorts and East Sea. Aside from food there are many other programs such as snowflake watching, ice fishing, trout-catching with bare hands, ice sleds, skating, ice-carts, ATV(four-wheel motorcycle), snow sleds, and snow rafting, all designed for tourists with family members. Choi Gyo-Sun Chairperson of the Pyeongchang Trout Festival Committee stated. For details or inquiries visit the website of the Pyeongchang Trout Festival (festival700.or.kr) or contact the Pyeongchang TroutFestival Committee by calling 82-33-336-4000.